← How can the resistance of the Venezuelan people and Nicolás Maduro’s government be explained? Monrovia – The Republic of Cuba has offered to provide more assistance to Liberia’s healthcare sector. Already five Liberians are studying medicine in Cuba and additional two are expected to join their counterparts soon. 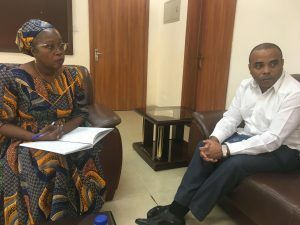 During a courtesy visit to Liberia’s Health Minister, Dr. Wilhelmina Jallah, on Monday, May 29, the Charge d’Affaire of the Cuban Embassy in Monrovia, Yordrnis Despaigne Vera, said his government would be dispatching a team of doctors to the John F. Kennedy Medical Hospital for service. The Cuban Diplomat also congratulated Minister Jallah for her preferment saying, his country was grateful to help the people of Liberia. He also recalled Cuba’s assistance to Liberia during the Ebola crisis and promised to strengthen their bilateral ties with Liberia. The Cuban Charge d’Affaires further promised that his country would not relent to transfer knowledge to Liberia whenever the need arises. For her part, Health Minister, Wilhelmina Jallah, thanked the Cuban Diplomat for his visit coupled with the many contributions his country has given Liberia. Minister Jallah expressed the need to learn from the people of Cuba how they eliminated malaria in their country, which she said was her key priority. She further appealed to the Government of Cuba to build the skills of Liberians studying in that country in specialized areas. On the issue of finalizing the monitoring agreement for assigning the Cuban doctors to the JFK Hospital, Minister Jallah said, that would be handled by the highest authority, as her work was basically to ensure elimination of diseases affecting the population.